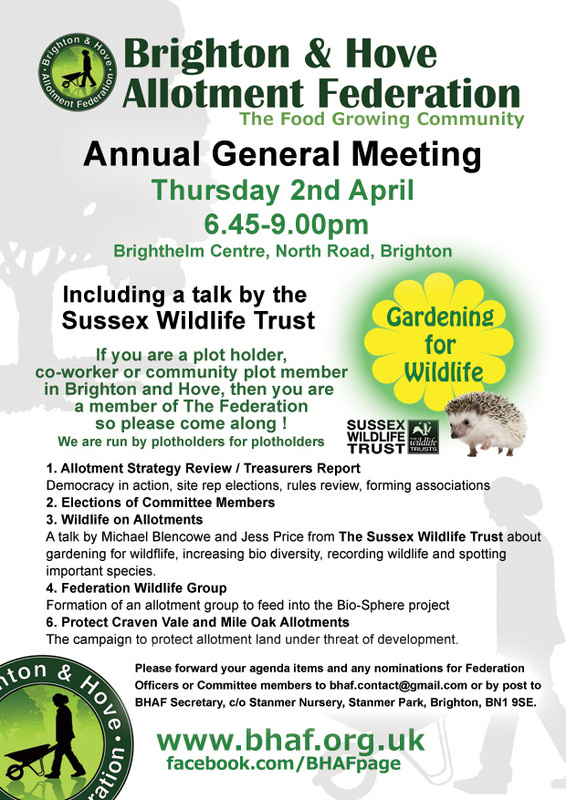 Date for your Diarys; BHAF Annual General Meeting is Thursday 2nd April 6.45pm at the Brighthelm Centre, North Road, Brighton. This year we are pleased to have a presentation form Sussex Wildlife Trust on ‘Gardening for Wildlife’ and how to spot and log important species. We would like to take this opportunity to invite nominations for Committee members. Belonging to the Committee is not as boring as it sounds! We have tea and biscuits and chat about many issues affecting plot holders across the city. We are keen to get new people on board so please get in touch if you have a little spare time to offer and would like to promote a vibrant food growing community that is committed to promoting sustainable growing, protecting the environment and encouraging open democracy and representation on all our sites.